Thank you, David, for another great article. I enjoyed this very much. Thank you, Sharon. Yeah, this post seems to be getting excellent traffic but no comments until yours. There is just no telling, no rhyme or reason to it as far as I can see yet. It’s summer! That changes things. I can’t read enough about this era of photography. I appreciate how thoughtful the photographers were of that day – they seemed to know the impact they were having on the art. Hi Sharon, thank you. Yes, in the summer perhaps sources of traffic other than photographers, are good thinking. Time to build up the other communities of readership. Photographers are out photographing. Your point about the photographers of the Golden Era being very aware of how they were impacting their art is insightful. There were a lot fewer photographers and photography was not recognized as an art. Therefore, everything they did had to be well-thought through. I have noticed and even written about on this blog, a few of the many photographers in the recent past who photographed all the time during the evening or early morning when the light was red. Many of them began using either Velvia film, which had its good and bad points, or they over-saturated their images anyway. There is a whole generation of photographers who were influenced by these photographers and it shows in a change in the overall look of much landscape photography. My father set out to show nature as it was, not to capture it at its most exaggerated moments. Yes, it is all about the light, but people that shoot everything in the reddest light possible are repeating a cliche, “Copying the copiers” as Carr Clifton puts it. You can definitely tell the difference between the generation that was influenced by color landscape photographers like Dad, Eliot Porter, William Neill, William Garnett, those who shared the beauty of subtlety, variety, shape and form, rather than the same pretty pictures of sun-drenched mountain tops, arches and lake reflections over and over. Also, the most important note about this is that those influenced by the more subtle approach either the first influenced generation or those they are now influencing are the ones whose work more often is found in museums and top galleries. The over-dramatized work may sell well in tourist areas, but not with the discerning fine art photography collector. I’ve been on the road myself for about a week now and haven’t had much time for keeping up on the blogs. I’m sitting in SF right now and just wanted to post a quick reply to you. Once again, a very interesting and worthwhile post David. I’ve read much about f64 in Adams and Weston’s writings as well as elsewhere, and have always admired the approach of those pioneers of photography as art. It’s truly fascinating to read your perspective on them as well as about your dad’s involvement. From what I see, and you can correct me if I’m wrong, it appears that your dad was very much a bridge between the Adams/Weston/Strand/White generation and a younger generation of photographers. No? Hi PJ, thank you for the comment and excellent question. Dad never set out to be the bridge. Even after he was teaching workshops regularly, he never thought of himself as an influence or even a teacher. He resisted the concept of gurus in any endeavor. He never even liked the word “influence” applied that way. At the Center For Creative Photography in Tucson, I even found an exchange of letters between Dad and Edward Weston where they agreed that the word “influence” is not a good label for what a young artist learns from an older one. The irony is that a generation of photographers who are now literally the who’s who of landscape photography, have either written or said that they were “influenced by Philip Hyde.” What I was saying above, is that you can see it in their work. You can sense it in the feel of their websites. You can hear it in the way they talk about photography. They believe in living or at least becoming close to the land, in letting the land speak, in showing nature in her many guises and moods, not imposing their ideas and pre-conceptions for photographs on the land, and not limiting photographic vision to certain times of day when the light is “magical” or to subject matter that consists of the “roadside landmarks” and well-worn cliches. These people are now thankfully influencing a whole new batch of landscape photographers that I observe coming up with good taste. People who took workshops from John Sexton, for example. These are the people whose work is most often found in the best museums and galleries. What I also see at the same time are certain landscape photography masters that were able to make epic photographs, such as Galen Rowell and others. 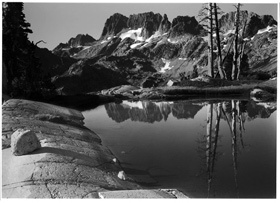 Galen Rowell did something unique, he mountain climbed, he invented the genre of adventure photography. His work was superb. However, I am not so sure about the photographers who try to do what he did. I think they often end up with oversaturated images, predominantly of alpenglow mountaintops that everyone else has since done repeatedly. Several other types of images that Galen Rowell often did first, others have now done over and over. That whole direction of super-dramatic, pretty pictures that are all made around sunrise or sundown has now become cliche and more likely to be found in certain galleries of certain photographers who sell millions of dollars of prints of the same pretty pictures to tourists who are easily wowed, but the photographers work is easily forgettable and not pursued by serious photography collectors. Of course, there are always the very few who are truly great in any era. Then there a bit more who are good and many, many who are fair, mediocre and bad. The same can be seen in any art form. Hi Sharon, thank you for your interesting observation about the good, the bad and the ugly in landscape photography and art. It is true that some believe that art is mainly, or even only, in the eye of the creator. According to my friend Dennis Flynn, an artist who also taught at the collegiate level, this is one of the claims of some artists and art officionados: the only art that is the true art is made for the artist alone. However, even if you were to agree with that way of looking at it, which I don’t, but if you did, the believers in this philosophy are usually not the ones who make all the over-saturated photographs. The hopped-up images are made that way precisely because the creator thinks someone else will be looking and buying the print because it is somehow prettier. Plenty of people are fooled by this. To match all the bad art, there are the majority of people who know nothing about art. What is that saying about two suckers born a minute and two over-saturated digital print Photoshop manipulators to take them?